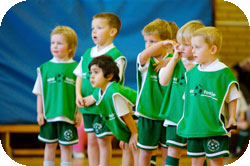 Our coaches will encourage children’s confidence and talent with fun games & equipment throughout their training course. We teach a few simple warm up and cool down exercises, moving onto ball control and shooting then progressing into more challenging equipment to help grow your child’s natural ability. Parental participation is often required at this age to encourage your child to join in and build confidence. We now start to increase your child’s co-ordination skills. Our coaches will incorporate more skilled techniques to develop your child’s agility. After the warm up exercises and plenty of fun games using footballs and equipment, a mini-football match may be played Your child will enjoy being part of a team and acquire a basic understanding of the rules of football. At this stage we generally find your child’s confidence has grown enough for you to take a well earned break at the side lines and let our coaches wear them out! Mini Footie Football Academy wants to give a natural progression for all our members when they reach 5 years old. At the Mini Footie Football Academy they can continue with the high level of football training that they have already developed and progress on to our Mighty Strikers training class. The children will further their skills and technique to go on to start playing football matches whilst learning the rules and regulations which the game presents to them. 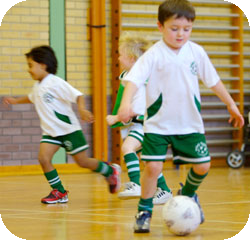 Still held at indoor venues to enable the children to train all year round in a safe and secure environment.